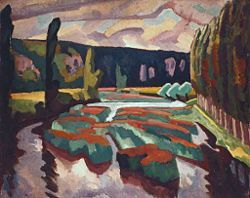 River with Poplars, circa 1912, Tate Gallery. Roger Eliot Fry (December 14, 1866 – September 9, 1934) was an English artist and critic, and an influential member of the Bloomsbury Group, an English group of artists and scholars (associated with the French Bohemian movement) that existed from around 1905 until approximately the time of World War II. The members frequently gathered to discuss aesthetic and philosophical questions. Members included Virginia Woolf and her sister, Vanessa Bell, together with her husband, Clive Bell. Despite establishing his reputation as a scholar of the Old Masters, as he matured as a critic, he became an advocate for more recent developments in French painting, to which he gave the name Post-Impressionism. His art became influential in England, as it was some of the initial modern art to appear and gain popularity at this time. Roger Fry was born in London, England, the son of a judge, Edward Fry. His mother was a homemaker. His parents belonged to a wealthy Quaker family, and sent him to study at King's College, Cambridge. During his time at Cambridge, Fry became a member of the Cambridge Apostles and initially took an interest in the natural science “tripos.” After graduating from the university, he became bored with this subject and decided to pursue an artistic career rather than continue his scientific studies, much to his family's disappointment. In 1891 Fry traveled widely, including trips to Italy and Paris to study art. Eventually he specialized in landscape painting. He began to lecture on art and also became a critic and author. He made his debut in art criticism in 1893, with a review of George Moore's book Modern Art, for the Cambridge Review. He continued to lecture on art and in 1894 he began lecturing on Italian art for the Cambridge Extension Movement. In 1896 he married the artist Helen Coombe, which resulted in a troubled period in his personal life. During their marriage, Helen and Roger had two children, Pamela and Julian Fry. Helen suffered from mental illness throughout her life and was committed to a mental institution in 1910, as her condition was worsening. Helen remained in this institution until her death in 1937, leaving Roger Fry alone to tend to the children. He first met the artists Clive Bell and Vanessa Bell in 1910 when they invited him to lecture at Vanessa's Friday Club, which was the artistic equivalent of her brother Thoby Stephen's literary soirees held on Thursday evenings. After this meeting, he became fast friends with the couple, particularly Vanessa, and was very involved in the founding and support of the Bloomsbury Group, which Vanessa and her sister, Virginia Woolf later started. This group focused on the importance of love, truth, and trust between friends, which they interpreted not according to traditional notions of fidelity, but rather infamously developing a fluidity of romantic relationships within the group. During a holiday to Turkey with the Bells in 1911, Fry began his love affair with Vanessa Bell. Vanessa was thought to be emotionally unstable and extremely vulnerable after experiencing a difficult recovery following the birth of her son Quentin. Fry offered her the tenderness and care she felt was lacking from her husband, Clive Bell, who was rumored to have numerous lovers himself. They remained life-long close friends, even living together in one of the Bloomsbury group main facilities. However, Roger's heart was broken in 1913, when Vanessa fell in love with Duncan Grant and decided to live permanently with him. Afterward he had numerous short affairs with various artists, such as the Omega artist, Nina Hammett, and Josette Coatmellec, which ended tragically in suicide. Finally, Roger found happiness with Helen Maitland Anrep. Consequently she and Roger had a special bond; her first marriage had ended in ruins as well. She became his emotional anchor for the rest of his life, and completely supported his work and career. Although they never married, Roger and Helen lived together until he died. Roger Fry died very unexpectedly on September 9, 1934, following a fall at his London home. His ashes were placed in the vault of Kings College Chapel, Cambridge, in a casket decorated by his long-time love and fellow Bloomsbury group member, Vanessa Bell. His death caused great sorrow among the members of the Bloomsbury group, who loved him for his generosity and warmth. Virginia Woolf, Vanessa's sister, novelist and a close friend of Roger as well, was entrusted with writing his biography, which was published in 1940. Roger Fry's first book, Giovanni Bellini, was published in 1899. He regularly contributed articles and criticism to the magazines the Monthly Review and the Athenaeum, and in 1903, he was involved in the founding of Burlington Magazine, acting as a joint editor from 1909 to 1918, and helped turn it into one of the most important art magazines in Great Britain. In 1906 Fry was appointed Curator of Paintings at the Metropolitan Museum of Art in New York. This was also the year in which he "discovered" the art of Paul Cézanne, beginning the shift in his scholarly interests away from the Italian Old Masters and toward modern French art. In 1910 Fry organized the exhibition Manet and the Post-Impressionists at the Grafton Galleries, London. Despite the debate surrounding the exhibition, Fry followed it up with the Second Post-Impressionist Exhibition in 1912. This exhibition was patronized by Lady Ottoline Morrell, with whom Fry had a fleeting romantic attachment. In 1913 he founded the Omega Workshops, a design workshop whose members included his friends Vanessa Bell and Duncan Grant. Fry formed the company, and its works were shown anonymously, marked only with the Greek letter omega. Vanessa Bell and Duncan Grant produced designs for Omega, and Wyndham Lewis was initially part of the operation. Lewis however split off at an early stage, taking with him several other participants to start the Rebel Art Centre after accusing Fry of misappropriating a commission to decorate a room at the Ideal Home Exhibition in the autumn of 1913. Edward Wolfe worked at the Omega Workshops hand painting candle-shades and trays and decorating furniture. Wolfe, who died in 1982, was one of the last of the Bloomsbury painters. Omega closed in 1919, but became influential in interior design in the 1920s. A revival of interest in Omega designs in the 1980s led to a reassessment of the place of the Bloomsbury group in visual arts. Fry re-edited and updated a collection of his best articles and writings to produce his best known book, Vision and Design, which was published in 1920. As well as Western art, the book examined the use of form and aesthetics in ethnic art from Africa, America, and Asia. It was a great success, reinforcing his position as England's leading art critic and it is still recognized as an extremely influential work in the development of modernist theory. Like his fellow Bloomsbury member, Clive Bell, Fry was a formalist, emphasizing the importance of a work of art's formal properties. Formalism is popularly described as the triumph of “form” over “content,” as the critic emphasizes the technical aspects of the work over its thematics. The formalist approach roughly came into being at around the same time that representation gave way to Impressionism, as artists sought new techniques to express their artistic insights. Beyond his own art, Fry also was an influential critic and lecturer in the arts field, especially on painting. He is considered the first figure to raise public awareness of modern art in Britain, and is often described as a great influence on art itself by critics and admirers alike. The term Post-Impressionism was coined by Fry in 1914, to describe the development of European art since Monet (Impressionism). Post-Impressionism was both an extension of Impressionism and a rejection of its limitations. Post-Impressionists continued using vivid colors, thick application of paint, distinctive brushstrokes and real-life subject matter, but they were more inclined to emphasize geometric forms, to distort form for expressive effect, and to use unnatural or arbitrary color. The Post-Impressionists were dissatisfied with the triviality of subject matter and the loss of structure in Impressionist paintings, though they did not agree on the way forward. [H]e was not one of those characters who have, as we are told by their biographers, an instinctive love of their kind. His kind often amazed him and shocked him. His eyes, shining beneath the bushy black eyebrows, would fix themselves suddenly, and, looking as formidable as his father the Judge, he would pronounce judgment. 'You are bolstering people up in their natural beastliness', his words to Sir Charles Holmes who had given him, innocently, a book on fishing recall some awkward moments in his company. But if not gregarious he was sociable – 'incurably sociable' he called himself. His friends meant so much to him that he would give up the delights of wandering from village to village, from gallery to gallery, in order to be with them. Spring after spring he would exclaim, 'I feel very much inclined never to come back to England, just to wander on into Spain and Morocco...', but the sentence would end, 'if you wretches will live in London, then to London I must be dragged back'. ↑ Woolf, Virginia, Roger Fry, (London, England: Vintage (RAND)), 2003. This page was last modified on 20 November 2013, at 17:04.